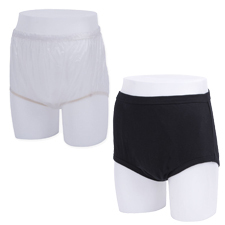 Incontinence waterproof pants provide excellent security for urinary and faecal incontinence. They are made from a rustle free PVC making them discreet and comfortable. Featuring elasticated waist and legs for a secure fit and extra protection, they are ideal for wearing over an All-In-One or Pull Up Pant.